Fresh air, clean water, and natural green spaces for kids, for families, for wildlife— this has been the ongoing vision of West Creek Conservancy. Cleveland Metroparks West Creek Reservation has become a reality; and the evolving vision of an interconnecting greenway trail linking multiple neighborhoods directly to that Reservation has been progressing. Greenways generate environmental awareness, community identity, healthy living, and pride. The vision of a 20-mile natural public trail network, the West Creek Greenway, linking the communities of Seven Hills, Parma, Brooklyn Heights, and Independence to West Creek Reservation has opened the door to new opportunities . . . and new challenges. The Conservancy is now seizing a new challenge – the challenge to connect these neighborhoods, schools and business districts to Cleveland Metroparks Ohio & Erie Canal Reservation, Brooklyn Heights Park, James Lovell Park, South Park, Center Park, Green Valley Park, Cricket Lane Park, Elmwood Park and Cuyahoga Valley National Park; to create new historic trailheads at Stearns Homestead and Henninger House; and to link the West Creek Greenway Trail directly into the Ohio & Erie Canal Way Towpath Trail. This trail route will include 9 miles of West Creek stream corridor. In partnership with the Conservancy, Seven Hills completed a 1-mile segment of the West Creek Greenway extending from Broadview Road, past the and Recreation and Seven Hills Civic Centers, to Cricket Lane. The Cambridge Crossings Company donated to the Conservancy a 2.5-acre natural area on South Park Boulevard in Parma that is along the proposed West Creek Greenway Trail route. The 10-acre confluence site where West Creek meets the Cuyahoga River in Independence provides Greenway access adjacent to the Ohio & Erie Canal National Scenic Byway and the Cuyahoga Valley Scenic Railroad extension near the Metroparks Canal Way Reservation. Brooklyn Heights, in partnership with the Conservancy, completed a trail segment and bridge over West Creek within Brooklyn Heights Village Park. Eventually, this trail will connect to the Henninger House and multiple residential neighborhoods in Parma and Seven Hills, as well as to the Broadview Road Quarry District commercial area. In Independence and neighboring Valley View, the Hemlock Creek All-purpose Trail will become a cornerstone of the Greenway Trail System between Brecksville Road—and ultimately the Towpath Trail. In Parma, Cleveland Metroparks constructed connector trail along West Ridgewood Drive from Broadview Road to the West Creek Reservation entrance, in addition to approximately 3 miles of trail and bridges within the Reservation. Partnering with Cleveland Metroparks and the City of Parma, the Conservancy acquired a vital trailhead at the end of Dentzler Road in Parma, providing direct neighborhood access into the West Creek Reservation for hundreds of homes between State and Pleasant Valley Roads. The Conservancy utilized a Clean Ohio Trails grant and the Recreational Trails fund to acquire land that skirts the border of Parma, Seven Hills, and Brooklyn Heights connecting Parma’s Historic Henninger House to Brooklyn Heights Park. 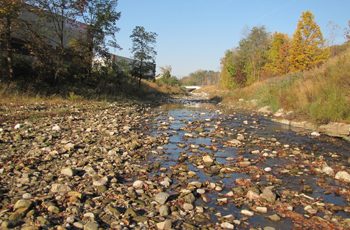 Multiple Clean Ohio Conservation Fund grants as well as private donations of land have enabled the acquisition of nearly a dozen properties in Seven Hills and Parma, adding over 30 acres (and nearly a mile) to the West Creek Greenway. Primary responsibility for planning, initiating, and overseeing progress on the West Creek Greenway, rests with the Conservancy’s Trails & Greenways Committee. Committee functions include planning studies, land or right-of-way acquisition, coordination with the public and other organizations, and identification of potential grants and funding. The Committee also makes recommendations for action items and helps coordinate trail implementation efforts, working to establish priorities, determine prerequisites, and develop status reports with project maps for each trail segment. If you have information or suggestions that could be helpful to the Committee, or if you would like to learn how you can become involved, please call the office at 216-749-3720 or email info@westcreek.org.